Japanese Episode DP 143: "The Jouto Festa! Chicorita and Waninoko Enter!!" American Episode 1238: "An Egg Scramble!" As our heroes arrive in a new town, they spot a Marill wedged in between two buildings. After our heroes help pull the pokemon out, Marill's trainer, a young girl named Kotone, appears and thanks them. She explains that she's from Jouto and invites everyone to go to a festival being held in town to promote the region. As they walk around the town, Satoshi and his friends learn that Kotone is a member of the festival's staff! Eventually, they are introduced to Kazunari, an aspiring young Breeder, and his father, the organizer of the event. After some time, Kotone takes the stage to tell everyone about Jouto's three starter pokemon. She then decides to challenge Hikari to a battle on-stage to showcase its battle skills. Hikari accepts, and the two trainers begin a battle with the starter pokemon of their respective regions. Hikari wins the battle and is given a pokemon egg as a prize, but the Rocket-Dan appear almost instantly and steal it! Satoshi-tachi, Kotone, and Kazunari all chase the Rockets into the nearby forest. A battle ensues, and before long the Rocket-Dan is defeated and the egg is retrieved. After returning to town, Hikari's egg begins to glow and hatches into a Hinoarashi! 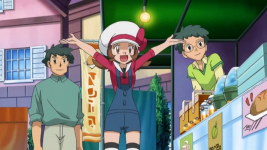 After everyone congratulates the young Coordinator on her new pokemon, Kotone and Kazunari ask if they can join Satoshi and his friends on their journey. They agree, so the group of five trainers hit the road for their next adventure. Welcome to Pocket Monsters Diamond & Pearl Episode 143, "Shameless Promotion! HeartGold and SoulSilver Enter!!" I think that's what most people are going to take away from this episode, really. I mean, check out my "Important Places" list up there; Kotone pretty much name drops every major city in the region. And look! Jouto Starters! Ibuki! Pokegear! Moo Moo Milk! OH MY GOD I HAVE TO BUY THIS GAME GIMME GIMME GIMME!!!!!!11!!1!1! Buried within this half hour commercial are the new protagonists, Kotone and Kazunari. I like that Kotone is out there getting Gym Badges instead of running around and getting Ribbons like every other female protagonist. I also like that she can be strong, playful, and annoyed - you know, just like a real person. Kazunari, on the other hand, gets my attention because the very fact that he exists defies all logic. Now don't get me wrong - I kind of like the guy. The fact that he gives Takeshi the spotlight, if only for a fleeting moment, gives him major points in my book. And, you know, he's gonna show us that he's not just dead weight on the team. But really, what's the point of creating this brand new character to join Kotone when they could have given us Kenta instead? It'd give us a game character, a chance to find out what Jun'ichi and Marina are up to, and it would let us see the much neglected Bakuphoon show up. And you know what? Kazunari is voiced by the same guy who did Kenta's voice in "The Legend of Thunder!" All the pieces are right there, producers! The dub is this big ol' cocktease for giving us hope that they'd start keeping all the Japanese music in the last episode and then going back to its old tricks an episode later. The second half of this episode was almost all dub music, and some of the stuff that got replaced was nostalgic Jouto stuff. I could also talk about Kotone's and Kazunari's dub names, but my opinion on learning characters' English names hasn't changed a bit since I did this comparison, so I won't delve into that. What I will talk about, however, is the fact that Kotone's voice actor in the Japanese version, Nakajima Megumi, plays a character named "Lyra" in the series Fairy Tail. Coincidence, or a clever "Destiny Deoxys" - style acknowledgment of the original voice actor? Her English voice actor, on the other hand, doesn't do that playful sarcasm thing as well as her Japanese voice actress does but does an otherwise decent job. Chicorita keeps its Japanese voice. So the Japanese version calls the event in this episode the "Jouto Festa" while the dub calls it the "Johto Festival." Not really sure why the Japanese version uses what I think is an Italian word, but it's a word that's used in Japanese quite regularly. Also, Kotone has this little speech quirk where she tacks on koto ne? ("right?" or "huh?") to the end of her sentences. Kotone...koto ne...get it? Anyway, this isn't present in the dub. She also calls Hikari "Hikarin" in the Japanese version, while Lyra calls her "Dane." Which, you know, sounds nothing like "Dawn" and brings up painful memories of godawful quote unquote comedians. Ash: "Woah, are you from Johto?" Lyra: "Yeah, have you heard of it? Hey, that reminds me, I've got something cool to show you." Like...way to ask a question and then not wait for the answer, Lyra. That line is pretty much the same in both versions, so its absurdity can be enjoyed no matter what version you're watching. First of all, I have to laugh at that little ice cream eating kid who's all like "Wow that's good thanks!" Is it me, or does the current dub make the worst voices for their one liner characters? A little later, Brock tells Khoury that Totodile's food is too sweet. In the Japanese version, Takeshi says that the food isn't bitter enough. 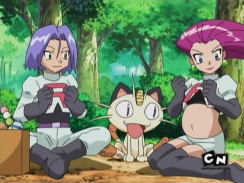 Meowth: "Well, we'll know when it pops." Jessie: "Last time I was this terrified I couldn't get my hair and nails done. What a nightmare." So in the original version, Musashi is bawling like a baby about how terrified she was. It's pretty hilarious seeing this grown, tough, proud adult crying like a little baby, but the dub decided that the Japanese translation is not funny at all and decided to stray from the original Japanese instead. Like I said, I wouldn't usually comment about this kind of thing because these types of rewrites have been going on since the series began.